Many stores attempt to sell you something right before paying for what you chose to purchase, videogames stores are a prime example fo this practice, when they ask you if you want to pay for some extra DVD damage/scratch policy, or house appliances stores that ask you if you want to extend your guarantee for one or two extra years, or even simply fast foods trying to sell you dips or sides and clothing stores that offer an extra item once you have reached a certain amount of money spent. Can you tell how incredible this strategy is? Can’t you already smell the money you’ll make? It’ s inevitable! You will increase the average value of each order in no time. This winning formula could work in a number of contexts: if you sell tickets for a concert, you could offer the opportunity to provide pictures with the artists, or an autograph for an extra price; if you sell gifts you could offer the wrapping service, if you sell gym subscriptions, you could add a “personal coach” service and so on! 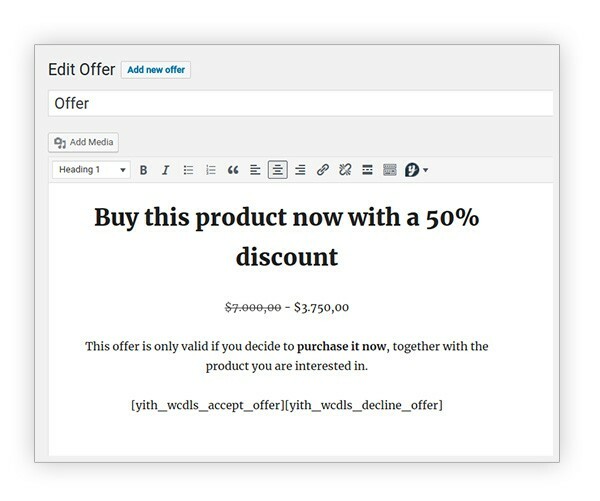 Thanks to our YITH Deals for WooCommerce plugin you can apply this strategy in the easiest way, by displaying a popup, right before the checkout page, with exclusive offers that are only going to be valid in that specific moment and compatible with the products your customers are about to purchase. 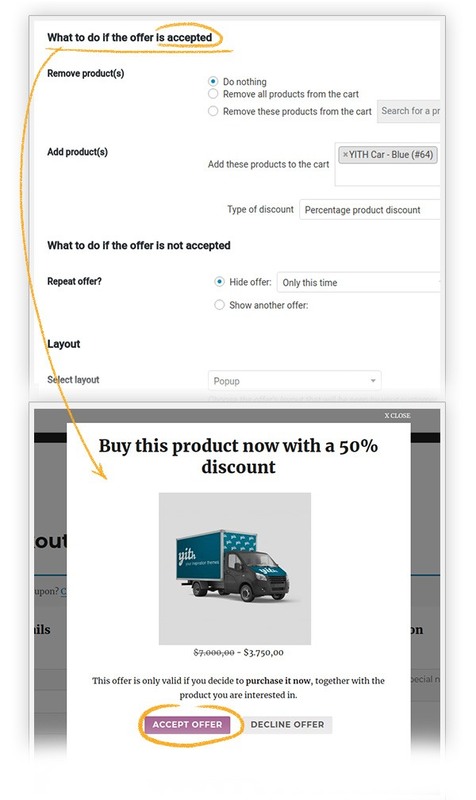 This plugin also allows you to link an offer to a single product, to schedule a promotional time period, to set it according to the amount spent, or show no promotion at all when customers add a product to their cart. Think about it, you just got yourself a real money making machine! Start increasing the average value of each one of your order, not doing so would be a big loss. 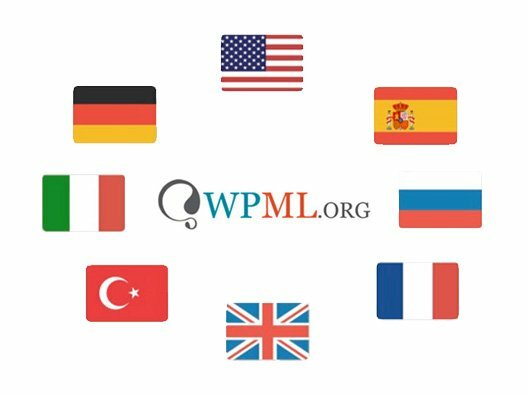 Very useful!Great tool! My sales increased at least a 25% since I started using it. A must for any successful store! More updates?I have this plugin for quite some time now, and I am a little disappointed with regards to the updates. I would have expected to see more features or more advanced options by now. I really hope they will be added in the near future, otherwise I think I will not renew my license. We are sorry to hear about your disappointment. There are some new features and improvements planned, the developers need to investigate the possibilities and they will indeed be added in the near future. good!Easy to use and quick to set up thanks! Please try out the premium version yourself in our free live demo. If you want to enter the backend, just click on the "Launch Admin Demo" button on the upper right side of the screen. 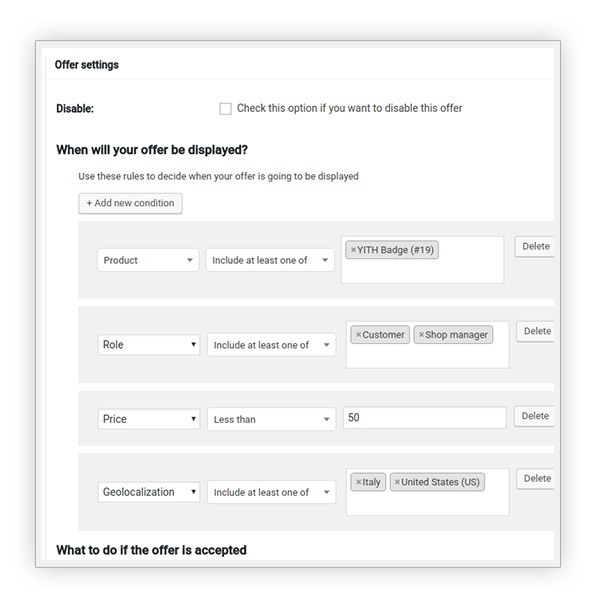 Follow these steps to set up your own test offer with the deal you want. 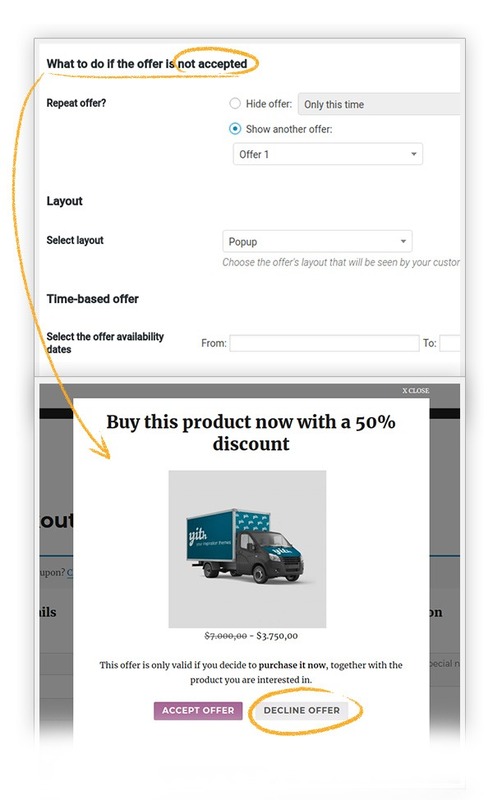 but the customer cannot select the variation to add in the offer. 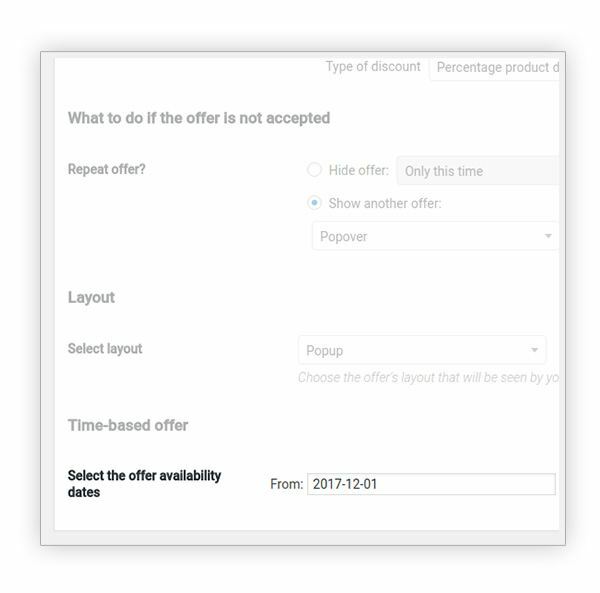 1.- This is not possible, you can only see another offer if the customer rejects it (not if it's accepted). I´m sorry for the inconvenience! I'll pass this to our developers and they'll fix it as soon as possible. For the moment this is not possible.  However, I'll send your request to our developers and they'll study the possibility to add it in a future release.